Sperry Marine has introduced a new stand-alone ARPA designed to fulfill IMO and SOLAS regulations which go into effect January 1, 1991. IMO, in its Resolution A.422(XI) "The Recommendation on Performance Standards for Automatic Radar Plotting Aids (ARPAs)," recommended staged implementation of mandatory requirements to carry ARPA. This recommendation has been ratified and is now part of the Safety at Sea Regulations (SOLAS). Prior to the IMO resolution, owners of many vessels had already installed collision avoidance equipment which does not fully meet the new performance standards. These ARPAs were "grandfathered" until January 1, 1991. Sperry Marine's new stand-alone ARpA is designed to ease the cost and inconvenience of upgrading the noncompliant ARPA systems. The heart of the new stand-alone ARPA is a highly flexible Adaptive Interface. This interface module allows Sperry Marine's proven RASCAR New Sperry Marine stand-alone ARPA. Radar/ARPA display to work alongside almost all existing radar systems. Owners of noncompliant ARPAs can now upgrade their systems to the same high resolution rasterscan display with the easy-to-use touchscreen controls featured in Sperry Marine's award-winning RASCAR radar/ARPA. The RASCAR display becomes a fully compliant 20-target ARPA with the existing radar installation, avoiding the expense of replacing the vessel's radar system. The Adaptive Interface even enables the RASCAR display to select which radar it is working with in a dual radar system. 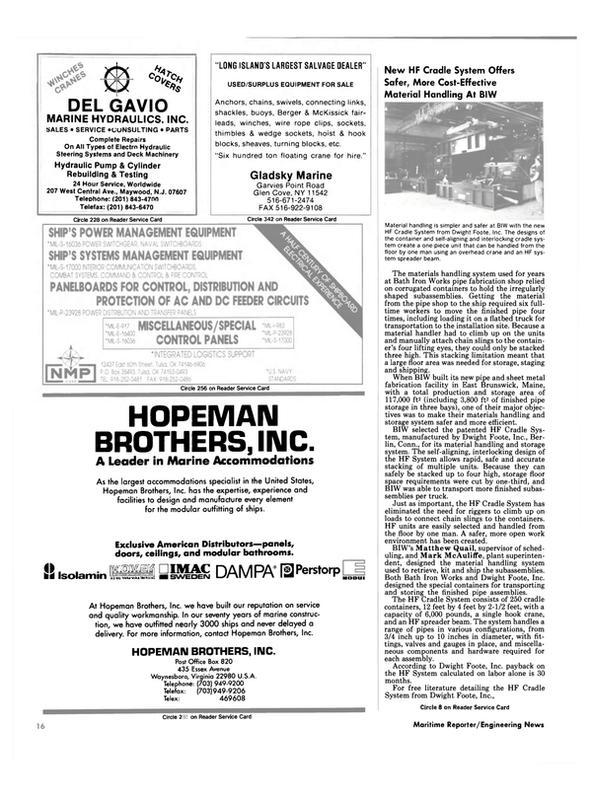 Sperry Marine Inc., a leading developer and manufacturer of marine navigation, guidance and communi- cations equipment, is a subsidiary of Newport News Shipbuilding, a Tenneco Company.